OTTAWA — Liberal backbenchers and cabinet ministers alike condemned former attorney general Jody Wilson-Raybould on Monday for surreptitiously recording a phone conversation with the country's top public servant, Michael Wernick. For many of them, the recording was the last straw in the SNC-Lavalin saga that has engulfed the Trudeau government and proof that the former minister can't be trusted as a member of the Liberal caucus. "Jody Wilson-Raybould? Should be gone. Gone. Should've been gone long ago", said Prince Edward Island MP Wayne Easter, calling her secret recording "about as low as you can go." The same sentiment was applied by most Liberal MPs to Jane Philpott, who quit cabinet in solidarity with Wilson-Raybould early last month, saying she no longer had confidence in the government's handling of the SNC-Lavalin affair. "The moment you stop trusting the government, I mean obviously you shouldn't be in the government or you shouldn't be in the caucus that supports the government," said Montreal MP Alexandra Mendes. Easter, a longtime MP who once served as solicitor general, suggested Philpott might have been "used" by Wilson-Raybould and several others said they'd like to know whether she condoned the secret taping. Wilson-Raybould submitted the 17-minute audio recording to the House of Commons justice committee last week to bolster her contention that she was improperly pressured last fall to intervene to stop the criminal prosecution of Montreal engineering giant SNC-Lavalin. The recording confirms her earlier oral testimony about the content of a Dec. 19 phone conversation with Wernick, clerk of the Privy Council — although whether anything he said amounted to "veiled threats," as she has alleged, is a matter of opinion. In a written submission to the committee, Wilson-Raybould said she took the admittedly "extraordinary and otherwise inappropriate step" of recording the conversation because she was home alone in Vancouver without a staffer to take notes and wanted to "ensure that I had an exact record of what was discussed as I had reason to believe that it was likely to be an inappropriate conversation." As it was, several Liberal MPs suggested the recording smacked of "entrapment." "In my listening to it, I felt she had to be reading from a script at times to try and draw out, to make the clerk and the prime minister and cabinet colleagues and us that sit in caucus with her look bad," said Easter. "Of course I'm angry." Mendes called the secret recording "unethical" and "treasonous, really." "Even if she had taped that conversation for the purpose of bringing it to the prime minister's attention, the thing is she never did." Montreal MP Marc Miller called the secret recording "distressing" and "somewhat repugnant." He noted that courts are typically skeptical about such "one-sided" recordings because "there's an ability of the person recording to prime the evidence, consciously or unconsciously." Toronto MP Adam Vaughan said the revelation "impacts the frankness by which we have conversations with people." A former journalist, Vaughan said: "I know that when you use a microphone and you know it's being recorded and the other person doesn't, it puts the other person at a significant disadvantage. It also puts the person recording it at inappropriate advantage. I think for those reasons there are rules for lawyers, there are rules for journalists, there are rules in place for how recorded conversations are used as evidence." Transport Minister Marc Garneau said it was "very inappropriate" to record the conversation without telling Wernick. "It is not an honourable thing to do." Both Wilson-Raybould and Philpott have said they intend to remain in the Liberal caucus and run as Liberal candidates in this fall's election. "Why would I resign?" Wilson-Raybould told Global News as she left Parliament Hill on Monday. "I'm just doing the best job I can." Prime Minister Justin Trudeau has thus far been unwilling to kick the former ministers out, maintaining that the Liberal party is a big tent that can accommodate diverse views. And until the secret recording was released Friday, Liberal ministers and backbenchers dutifully used Trudeau's script. "We're putting it behind us and my aim is that (Wilson-Raybould) and Jane are welcome and comfortable as part of our caucus," said Treasury Board president Joyce Murray. The recording proves Trudeau "not only had knowledge about the pressure being applied on the former attorney general but he and his office were, in fact orchestrating it," Conservative House leader Candice Bergen told the Commons, accusing Trudeau of providing "false and deceitful information" to Canadians about the affair. 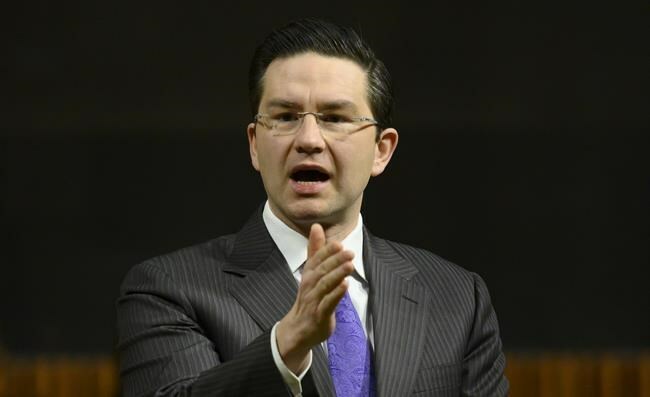 Conservative finance critic Pierre Poilievre, meanwhile, launched a one-man filibuster of the government's budget until the Liberals agree to further investigation of the SNC-Lavalin affair. "I have the ability to speak an unlimited period of time (on the budget) and I will be using that ability to demand the government end the coverup (and) agree to a parliamentary investigation into the SNC-Lavalin scandal," he told a news conference before heading into the Commons to begin an hours-long speech. House of Commons rules say the finance minister and the Opposition's finance critic can speak as long as they want about the budget, but only within the time allotted each day for government business. That means Poilievre's plan won't disrupt most other activities in the Commons and he has to speak for only a few hours at a time. Debate on the budget is also restricted to four sitting days. The Ottawa-area MP said he wants senior members of Trudeau's staff, as well as the prime minister himself, to testify before the justice committee about the pressure exerted on Wilson-Raybould. "When they agree to that, I'll stop speaking."